This exhibition brings to life the extraordinary work undertaken by a small team of American women volunteers who left comfortable lives in the United States to devote themselves to relief work in France during and after World War I. Their dynamic leader was Anne Morgan (1873–1952), a daughter of the financier Pierpont Morgan. As she rallied potential volunteers and donors on speaking tours across the United States, Morgan harnessed the power of documentary photography to foster a humanitarian response to the plight of French refugees. With haunting views of ruined French towns, portraits of refugees, and tableaux of American volunteers at work, the exhibition explores not only the human cost of war but also the potency of photographic propaganda and the influence of women's activism. The show traces the fieldwork of the American Committee for Devastated France, the volunteer civilian relief organization that Morgan created with her friend Anne Murray Dike (1879–1929). Morgan, with her commanding presence and social prominence, took the lead in fund-raising efforts, while Dike, trained as a physician, organized activities in the field. Works on view are drawn from two major collections. Fifty photographs and a montage of silent films are on loan from the Franco-American Museum, Château de Blérancourt, France, a national museum housed in the seventeenth-century château that served as the base of operations for the American Committee. Photograph albums, personal letters, sound recordings, and archival documents are drawn from the papers of Anne Morgan at the Morgan. When the first American volunteers arrived in northeastern France in 1917, they witnessed destruction on an astonishing scale. Several years of war had decimated the French countryside. "You can travel in a motor going forward in a straight line for fifteen hours and see nothing but ruins," Anne Murray Dike explained in 1919. People had lost nearly everything—not only their homes and livelihoods but a whole generation of young men. The committee commissioned photographs of the devastation in Picardy as well as the committee's activities. Full-page images ran in American newspapers, exhibitions were mounted, and sets of prints were sold for three dollars a dozen. The photographs conveyed to Americans the enormous need for relief in the form of monetary support, donations in kind, and volunteerism. Images such as Mme. Compagnon: "They shall not pass" captured the craggy faces of exhausted refugees—twice evacuated during the German occupation—after they had made their way back to their ruined villages determined to resume life on their home soil. As early as 1914, Anne Morgan had recognized the fund-raising potential of film, hosting the first New York screening of the Chicago Tribune's groundbreaking war newsreels. Over the next few years, millions of Americans crowded into theaters to watch similar footage, a portion of the box office proceeds often benefiting organizations such as the Red Cross. When Morgan's own relief committee launched operations in France in 1917, the moving image became a central tool in its publicity campaign. While the earliest films were produced in cooperation with the French army's well-established cinema unit, the American Committee later formed its own dedicated filmmaking team. The American Committee for Devastated France was one of many relief organizations—often founded and staffed by women—that sprang up in the United States during the First World War. The group was relatively small (some 350 women of a total of 25,000 who served abroad during the war), but the effects of its commitment were profound. Side by side with the people of northeastern France, these women created an astonishing array of services to revitalize life in a region considered by many to be beyond redemption. Committee applicants were required to speak French, hold a driver's license, and—in most cases—pay their own expenses, which could amount to $1,500 for a typical six-month stint. The requisite blue martial uniforms could be made to order for $45 at B. Altman Co. As she recruited volunteers, Anne Morgan made clear that an earnest commitment was expected. "We do not want sightseers who would like to go over for half a year to view France's battlefields," she told The New York Times. Sporting bobbed hair and working attire, committee drivers, or chauffeuses, struck the people of Picardy as the embodiment of the modern woman. Few French women of the time were licensed to drive, but American volunteers (including Gertrude Stein and Alice B. Toklas with the American Fund for French Wounded) took the wheel in service to a range of relief organizations. Philippe Pétain, the French army's commander-in-chief, arranged for the committee to establish headquarters in the seventeenth-century Château de Blérancourt—less than forty miles from the front. The women lived in barracks, worked long hours, and enjoyed intense camaraderie. "How Father would have hated these modern independent young women," wrote one volunteer, Marian Bartol, in a letter on view in the exhibition. Many of the women physicians in the United States (six thousand at the time of the First World War) were eager to contribute their professional expertise but were barred from officer status in the military medical corps. Margaret Ethel Fraser, a Denver gynecologist, joined the American Women's Hospitals (AWH), which was formed in 1917 to provide a venue for wartime service. The AWH formed a productive alliance with the American Committee for Devastated France, setting up a range of medical services in the hardest-hit regions. When writer Alexander Woollcott visited France in 1920, he was impressed by "a sunny, competent-looking woman from Denver" who emerged from a "neat little shack" in the devastated regions. An affiliate of the American Women's Hospitals, dentist Edna Ward provided cleanings, fillings, extractions, and instruction in basic dental hygiene. "It is amusing," wrote Woollcott, "to watch . . . children scamper away down the lane of ruins, each right hand bristling with a brand-new toothbrush." Mary Breckinridge (1881–1965), a pioneer in the practice of nurse-midwifery in America, was one of the committee's most distinguished volunteers. She organized children's health services, collaborated with the Florence Nightingale School of Nursing in Bordeaux, and studied midwifery and public health before returning home to Kentucky. There, drawing on her experience in post-war Europe, she created the Kentucky Committee for Mothers and Babies (now the Frontier Nursing Service) that sent nurses on horseback to women in the rural mountains. French children were particularly scarred by the ravages of war. The youngest had spent their entire lives as refugees; many had never known their fathers. When the American Committee commissioned these photographs of the devastated regions to publicize the people's plight, the beautiful faces of French children—some posed in shabby clothing, others neatly dressed as they engaged in volunteer-sponsored activities—were featured prominently. The American volunteers addressed the children's immediate needs for wholesome food, clothing, and medical care but quickly turned their attention from emergency aid to long-term support in the form of schools, libraries, and socialization, leaving an enduring legacy in the region. Bookmobiles and public libraries were an outgrowth of a major educational initiative that constituted one of the American Committee's most profound legacies. Partnering with Jessie Carson, a librarian at the New York Public Library and chair of the businesswomen's unit of the National League for Women's Service, the committee founded a network of public lending libraries in the region that eventually served as a national model. The committee's public libraries, housed in spacious barracks, included children's sections—a novelty in France—with recreational activities such as a story hour. Anne Morgan purchased the seventeenth-century château that had served as the base of operations for the American Committee for Devastated France and donated the property to the town of Blérancourt. She founded a museum there to document the history of French-American cooperation, from French contributions to the American Revolution to American service in France during the Great War. The château and its splendid grounds are now a French national museum. In 1948 after a visit to Blérancourt, Eleanor Roosevelt wrote of her thoughts as she passed through its monumental gate. "You can still imagine how grand the old château must have been rising beyond it," she wrote. "But you also are forced to wonder all over again, as you drive in, whether we human beings are bound to go on destroying each other and our possessions forever." Anne Morgan was the youngest of the four children of Pierpont Morgan and his second wife, Fanny. Anne and her brother, Jack, would both play key roles during the First World War. While Anne founded a major civilian relief organization, Jack led the firm J. P. Morgan & Co., which heavily financed the Western Allies even as the United States remained officially neutral. When the Second World War again brought devastation to northeastern France—including Anne Morgan's beloved Blérancourt—she took action a second time. Joining with veterans of her World War I committee and their sons and daughters, she formed the American Friends of France and the Comité Americain de Secours Civil, its French counterpart. In 1924 Marshal Pétain honored the two Annes who had done so much to revitalize devastated France—by making them officers of the French Legion of Honor in a ceremony at Blérancourt. In 1932 (after Dike's death), Morgan was elevated to the rank of commander, which was held at the time by only one other woman, the Countess de Noailles. Morgan was the first American woman to receive the French honor. After her death at the age of seventy-eight in 1952, she became the first American—and the first woman—to be honored with a marble plaque in the Court of Honor at the Hôtel des Invalides, near Napoleon's tomb in Paris. This exhibition is made possible through the generosity of The American Friends of Blérancourt. 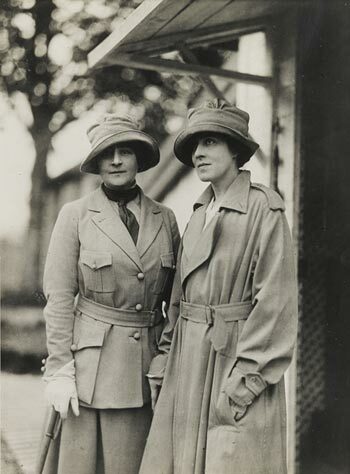 Anne Morgan and Anne Murray Dike, founders of the American Committee for Devastated France Blérancourt, ca. 1919–1921, sulfur-toned silver print Franco-American Museum, Château de Blérancourt.